Greg Floyd Jr. is a lot like a popular underground musician. Many people have claimed to see him play, but few actually have. “Eight months ago, nobody knew who he was,” Las Vegas Knicks coach Lamar Bigby said. Floyd, a 6-foot-8-inch small forward, has barely had a sniff of varsity basketball in his first two seasons while spending time at two high schools. Yet the rising junior at Desert Pines has emerged this summer as one of the area’s top prospects in the class of 2017. 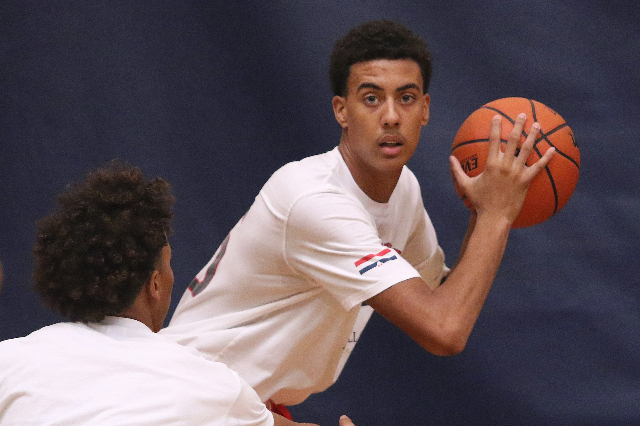 Floyd will suit up for the Las Vegas Knicks’ 16U team at the Las Vegas Classic, one of three major travel-circuit tournaments taking place locally this week to cap the July live evaluation period for college basketball recruiters. The Las Vegas Classic, Las Vegas Fab 48 and adidas Super 64 tip off Wednesday at multiple gyms across the valley and conclude Sunday. “I have something to prove,” Floyd said. “My whole school season, I didn’t play, so I’ve just been in the gym working out with my high school team and working out alone, personal workouts. Floyd, who only recently turned 16, spent his freshman season at Clark and saw action in a handful of games as the Chargers went on to capture the Division I-A state championship. Floyd scored a season-high 10 points in a 55-22 rout of Western on Jan. 29, 2014. Last season, Floyd never appeared in a game for Clark before transferring to Desert Pines in December “just to be in a better environment,” he said. Floyd was ineligible to play for the Jaguars as a sophomore due to the move. But starting with the local Pangos Spring Spectacular in April, Floyd’s recruiting stock has been skyrocketing thanks to his play on the travel circuit with the Las Vegas Knicks. Floyd has more than 20 scholarship offers, including from most of the Mountain West, and said his favorites at this point are Memphis, Michigan (which hasn’t offered yet), UNLV and Washington. Floyd is listed as a four-star recruit and the No. 69 player in the nation for the class of 2017 by 247sports.com. He is a three-star recruit according to Rivals.com and ESPN.com. Floyd said he drew inspiration this spring from his sister Monique Gittens, who died Dec. 8, 2014, at age 24. The Las Vegas Knicks’ 16U team features several local standouts, including Desert Pines’ Trevon Abdullah, Centennial’s Darian Scott and former Las Vegas High player Tyler Bey. But Floyd has been the focal point of many opposing defenses, which has been an adjustment, according to Bigby.